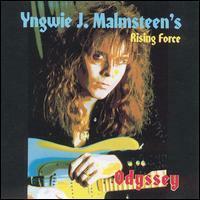 Odyssey is an album by guitarist Yngwie J. Malmsteen released in March 1988, With Joe Lynn Turner on lead vocals, with the three instrumentals being "Bite the Bullet" - a brief intro to "Riot In the Dungeons", "Memories" - the outro to the whole album, and "Krakatau," a six minute piece that contains many themes Yngwie still plays in concert today. The songs are influenced by 1970s heavy metal, such as Deep Purple's Machine Head and Rainbow's Rising, as well as by 1980s glam metal and hard rock, as can be heard in the tracks "Hold On", "Heaven Tonight" and "Dreaming (Tell Me)" . This was the last Yngwie studio album to feature Jens Johansson.